This article provides information about Application Catalog (and its counterpart, Software Center), which provide software installs and updates to supported Windows PCs in FAA. This software is packaged, tested, and updated by Technology Services at FAA to meet the needs of the college. It is therefore safe and can be installed on your computer without the need for administrative rights. 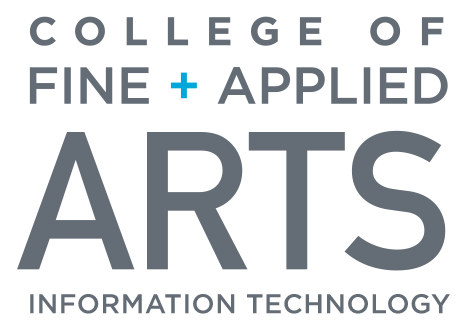 NOTE: The Application Catalog replaces the Appcat software self-service catalog. If you maintain a bookmark for the Appcat site, please discontinue using it. Supported Windows PCs in FAA. Customers of supported Windows PCs in FAA. Technology Services at FAA provides software installs and updates to supported PCs using Microsoft's SCCM (System Center Configuration Manager). SCCM is also used to provide anti-virus, add drivers, and to make configuration changes on computers. 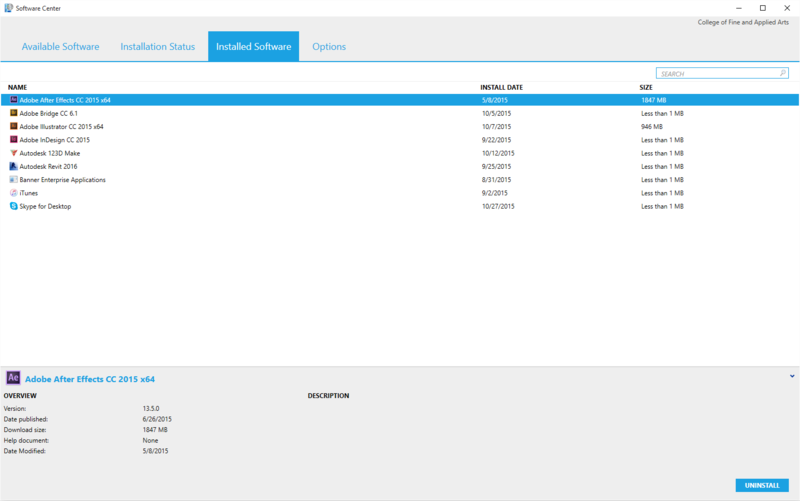 As of June 1, 2018, the client-side component for self-service application installs is Software Center. Software Center is an application installed on all supported PCs in FAA. Through it, clients can view and remove installed software, monitor installation progress, and re-install previously installed software. Software Center will also notify clients of available or required software changes. Software Center can be accessed via the taskbar, or by searching the Start Menu for "Software Center". 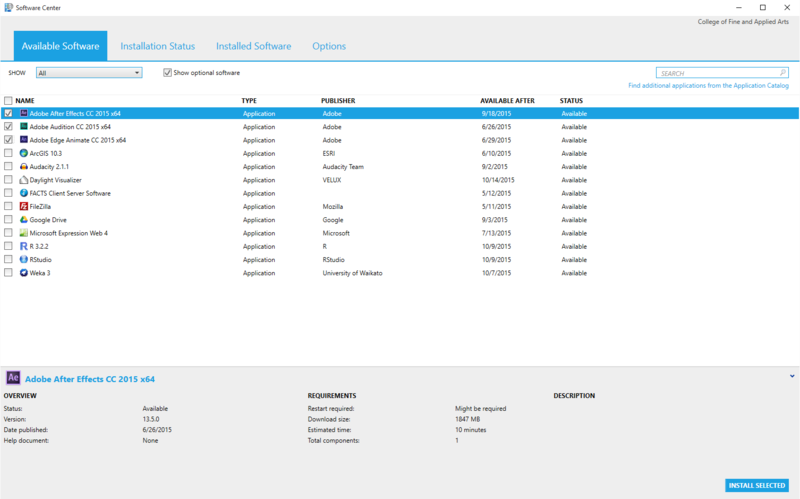 In addition to the base software, Software Center can be used to deploy a wide variety of University-licensed 3rd party applications at no additional cost. Please keep in mind that while some software is free or provided under the Campus Licensing Agreement, others must be purchased before Technology Services at FAA can install it. This is typically done on your behalf with a CFOAP from your business office. Technology Services at FAA can also install other software by request and can facilitate purchasing in many cases. If you are interested in an application that is not listed, please contact us so that we discuss adding it to our list of available options. New software and updates to existing software are tested by Technology Services at FAA before becoming available to our customers. In most cases, updates are released after-hours to minimize disruption, although important security updates are occasionally released at other points during the week. If a supported PC is 'awake' and online, it will periodically check in with the SCCM server for updates. This occurs at random intervals, typically within a 90 minute window. If a user is not logged in, required software will automatically be updated. If this requires a restart, the computer will be restarted automatically. If a user is logged in, the user will be notified that updates are either available or required via the taskbar. Clicking the balloon, or searching for and clicking "Software Center" via the Start Menu, will open the Software Center. 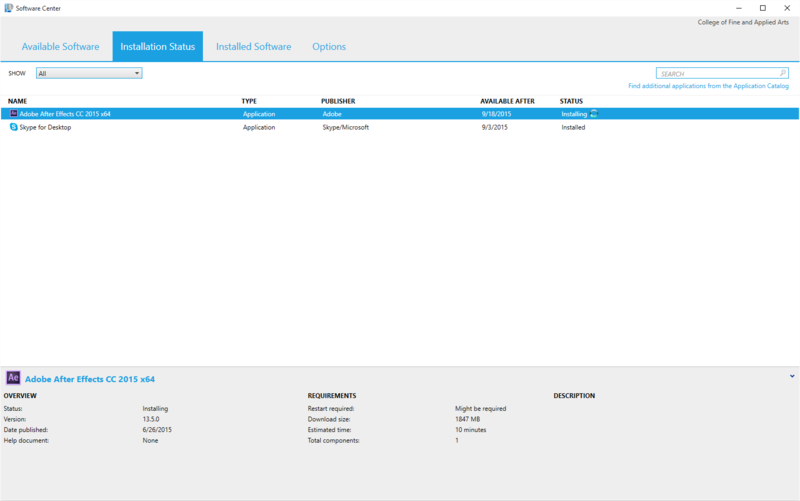 Customers may manage and track installations through this interface as described above. Lab and classroom PCs are updated silently and will not notify customers who are logged-in unless a restart is required. Most lab updates occur after hours during maintenance windows. For help with additional software and for general support, please contact the Technology Services at FAA Help Desk.